This is another video in our learn to quilt series. We are making a basic baby quilt with 5" squares for this series. This video will show how to layer the backing, batting and quilt top together. This layering is called a quilt sandwich. It also shows how to pin baste the quilt. Pin basting the quilt prepares the quilt to be quilted. Quilting attaches the three layers together. 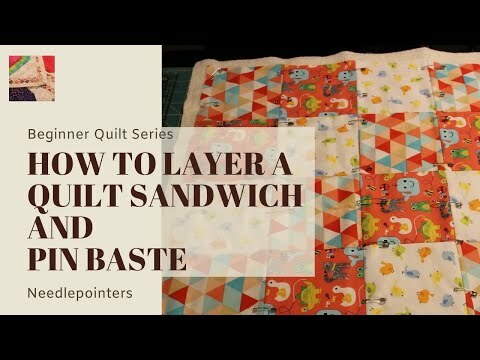 Click to watch the Learn to Quilt - Layer and Pin Baste video in Youtube. The quilt backing and batting should be a couple inches larger all around than your quilt top. This ensures that when you put the layers together, the quilt top will not be larger than the backing & batting. the 3 layers will be trimmed to the same size and "squared up" after the top has been quilted. The pin basting method demonstrated in this video is used to prepare a quilt for machine quilting the top. If you are going to hand quilt your top, you would hand baste your quilt together. 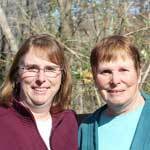 If you will be sending your quilt out to be quilted by a long arm quilter, please ask them what they prefer. They usually want you to bring the layers. 1. First you need to layer your quilt backing, batting and top together. Lay your quilt back on a large table with the wrong side facing up. 2. Place your batting on top of the backing and smooth everything flat so there aren't bumps. I like to use Warm & Natural batting for my quilts. You can find an affiliate link below to purchase batting. 3. Carefully place your quilt top facing up and smooth all 3 layers starting from the center and working your way out. Pin basting holds the quilt layers together so that you can sew/quilt them together. To pin baste, you start in the middle of the quilt. If your quilt is too big to fit on your table, you can slide it around in order to pin baste the entire quilt. 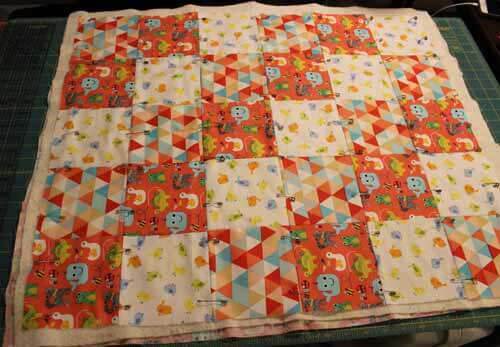 In a future video, we will show how to pin baste a larger quilt. For pin basting, use safety pins. It's not recommended to use straight pins or it will be hard to not prick yourself when you are working on sewing the top together! Place your first safety pin near the center of the quilt. Place your pins 3" - 4" inches apart. Work on one quadrant of the quilt at a time. So, to do this, start placing your pins from the center to across towards either the side of the quilt. Always smooth out your quilt towards the raw edges as you go along. You will then have a line of pins from the center to the left or right side of the table. Next, starting from your first pin in the center. Place pins towards you until you reach the edge of the quilt. Remember to smooth the quilt as you go. Now you should have pins which are half a rectangle. Keep pinning by starting again from the middle and placing pins from the center to the edge in a line. Then pin from the center to the edge closest to you. Keep pinning and smoothing the quilt until you have pins all the way to the corner. Watch the video for more pinning details. Next, follow the same procedure to pin one of the quadrants NEXT to the one you just pinned. Don't forget to keep smoothing your quilt out as you go. After you have the 2nd quadrant finished, then work on the other one which is adjacent to the first quadrant you worked on. Finish with the fourth quadrant. 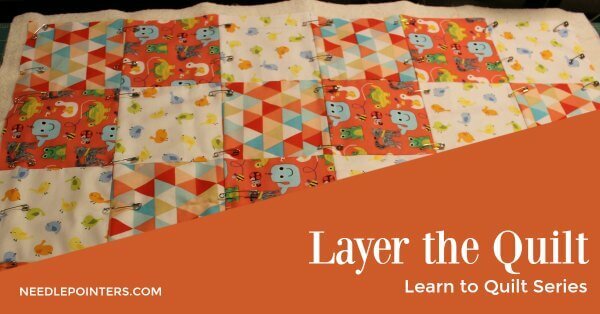 Watch our next video to find out some options for quilting the layers together and how to sew them together.